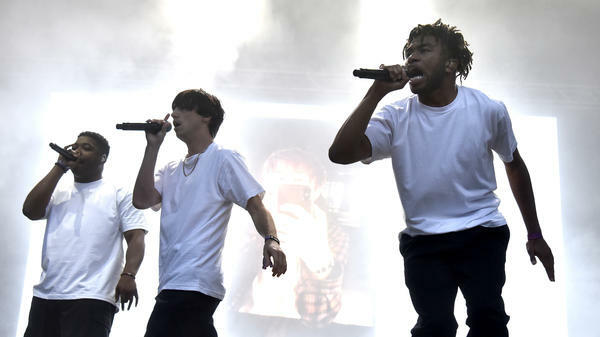 Dom McLennon, Matt Champion, and Kevin Abstract of BROCKHAMPTON perform at Lollapalooza 2018. The hip-hop boy band's latest album iridescence, is out now. Like much of the band's discography, the heart of the album is scattered but endearingly spry and honest. The tone of some songs, like album opener "New Orleans" (which features Jaden Smith) builds at a rapid pace. "I don't go to church, but I'm so spiritual / Pulled my life outta dirt, that's a miracle," rhymes Merlyn Wood. "Honey" is lighthearted joyride which touches upon escaping near-homelessness and boasts an underlying sample of Beyonce's "Dance For You." "J'ouvert," which was released with an accompanying music video just hours before the album, pulls from rap-rock, pop and West Indian influences and samples the soca track "Doh Blame Me" by Lavaman. "San Marcos," named after the Texas city where the members of Brockhampton assembled and first started making music together, poignantly questions reality and life choices over sparse guitar strings. "Grapple with reality to break out of these shackles," Dom McLennon raps before the London Community Gospel Children's Choir sings: "I want more out of life than this." During an interview with the BBC this past August, the band claimed to have produced and recorded the album in the span of 10 days while in the world-famous Abbey Road Studios in London. In a tweet soon after the album's release, band member Kevin Abstract dedicated the record to London.